the ingredients are probably far from classic, but they worked for me. freshly grated carrot, gluten free oats, mushrooms, walnuts, sunflower seeds, garlic & dates make their way into a mighty fine burger. even the green carrot top is added for a little zing- did you know carrots are part of the parsley family? the tops are edible and are awesome tossed in salads and used in place of parsley. 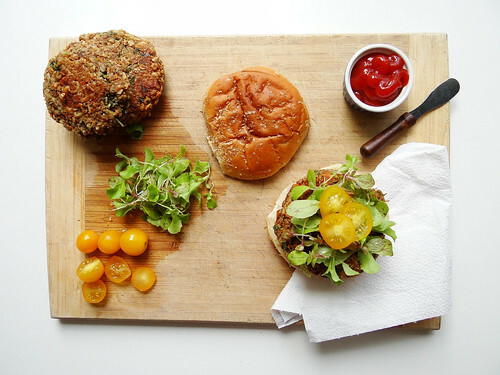 all the ingredients are tossed in a food processor and whirled until combined & shredded to the consistency specific to your tastes - beware though a chunky veggie burger may not hold together as well as a more finely shredded one. the mix is formed into 4 patties - easy. then pan fried until golden brown on each side and quickly baked in the oven. if grilling you can skip the baking and cook directly on the grill. 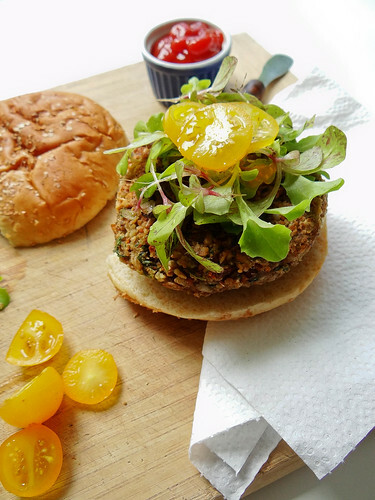 i had just thinned out my lettuce patches the morning i made these veggie burger. i cannot bear to toss away my baby seedlings - i have the hardest time thinning out my veggies, i know it is imperative too create a space where the rest of the gang can flourish, but what about the little guys! well, they got rinsed off and topped my veggie burger - micro greens! as these did not last long enough to freeze i am not a 100% certain how they are straight from the freezer. however, i am pretty confident that they would freeze well. another great thing about these burgers, they are super easy to throw together.i love summertime recipes that take minimal effort to prepare and cook.more time for cocktails & friends! 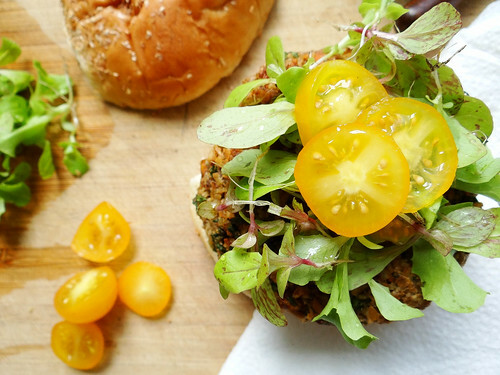 happiness = finding the perfect veggie burger for this summer season. 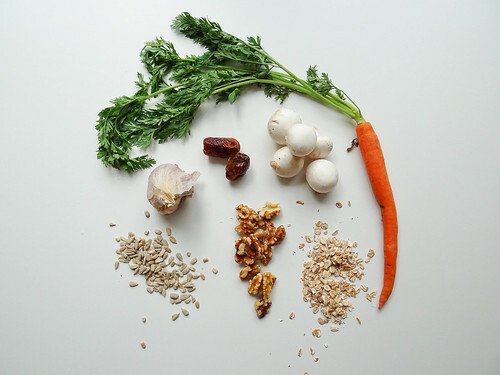 place all ingredients in a food processor fitted with an s blade. process until ingredients are finely shredded and mixture comes together. remove the blade and form 4 patties, about a half cup of mixture per pattie. in a medium fry pan, over medium high heat drizzle about a tsp of canola oil in the pan. pan fry each burger until golden brown on each side. bake in a pre heated 350* oven for 10 minutes - or cook directly on the grill. if cooking on the grill, either brush the grates/burger with additional oil or grill burger on tin foil. serve on a vegan whole grain bread with your favorite toppings! Love this combination - I will be pinning this for future meal planning. 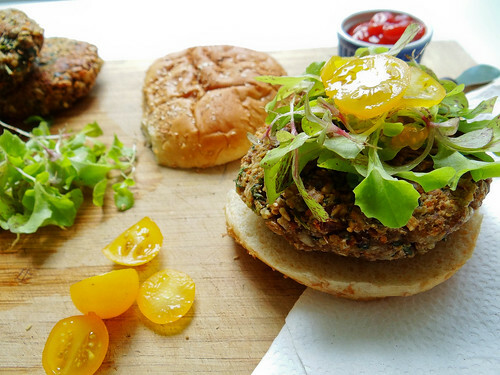 I love veggie burgers with mushrooms, it gives it such a hearty and filling texture! i agree with your definition of the classic veggie burger, and so does dayv! these look delicious and i can't wait to make them! Isn't that little fun fact neat! It makes total sense the tops of the carrots look alot like parsley :) The Carrot tops seemed to have a hint of spice/zest - I loved the flavor it added to the burgers! And I did not know carrot was part of the parsley family either! Love learning something new every day! I only learn from the best (insert your name here)! Our Memorial Day weekend was super busy but amazing - the weather was beautiful....now only if it would stop raining! I don't think I've had my first veggie burger of the season yet - I will have to get on that! Our weather this weekend wasn't nice enough for BBQ'ing though, we were stuck inside. I didn't know you could use the carrot tops either - could you detect any taste from them in the burger - do they taste like parsley? This would be so good paired up with your avocado potato salad! The carrot tops had a bit of a zesty/spice taste, they were really good and added a surprising flavor - i love having something green in everyone of my meals and this fit the bill perfectly! 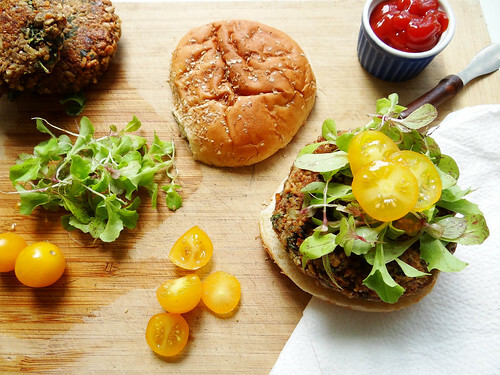 Ooo a veggie burger party, now that sounds like a good time! These look great! 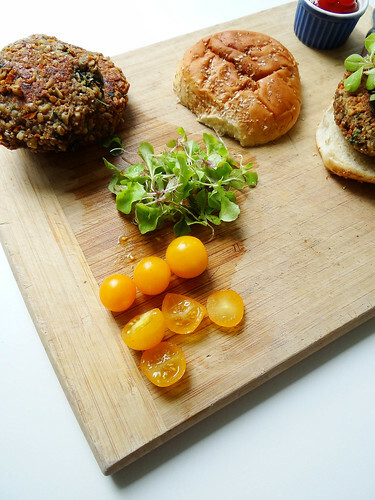 I'm not a fan of mushrooms (which is the bane of my existence as a vegetarian) but the idea of dates in a veggie burger has me interested! YUMMM!! those burgers look so tasty! i love the yellow tomatoes on there too! great pop of color! thanks for sharing! I LOVE little heirloom cherry tomatoes, I can't wait for my black cherry tomatoes this Summer! I love this recipe! I am bookmarking it immediately so I can make it. 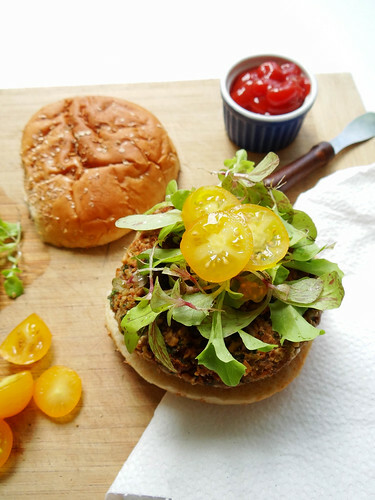 They really do look like the perfect veggie burger! I totally agree with you on the perfect toppings too- although I would have to add mustard, I am a mustard fiend!! Looks so delicious and wholesome. This was my second attempt at veggie burger making and I am totally hooked - so so easy and the possibilities are endless! Excellent, if you end up making these Uru let me know how they turned out! This looks so good! I've had the worst luck with homemade veggie burgers in the past in terms of texture, but this one looks like it held up well in the pan. Also, I had no idea carrot tops were edible, I will have to try cooking with and eating them now. This held up really well Matt, this burger I would 100% feel confident grilling with...some others not so much! Isn't it great, edible carrot tops! LOL I most definitely do not live on the Sun - I am French Canadian with a good dose of Iris, I would look like a lobster :) Tanning is no where in my vocabulary, it is more like SPF 90. Everything looks so fresh and delicious! Would love to have one of these burgers right now. Thank you!...I loved your last post of the cupcakes, they are so adorable - I am having in issue with Captcha- as in i get an big red x - I have been reading your posts and loving everyone of them! Thanks for letting me know! I'll have to check that out. Heather! 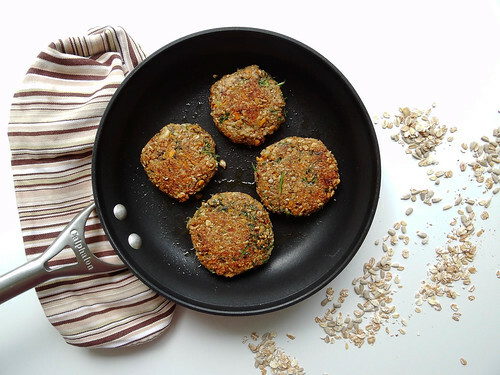 Now I'm totally torn between making these or your Sweet Potato burgers! You are a veggie burger queen! These burgers look delicious. I had no idea they were that easy to make, well at least you make it look very easy! They are really super easy to make - just toss in a few ingredients- veggies, a binder and somt type of grain/seed and you are good to go...if I knew how easy they were I would have been making them years ago! 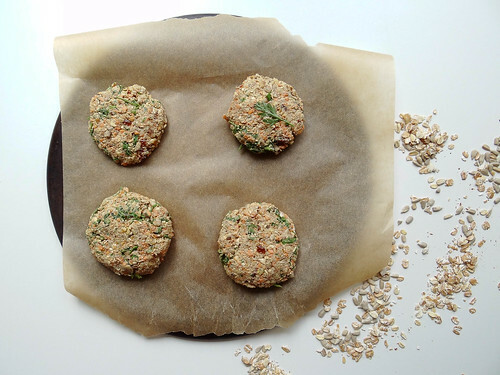 I've been meaning to make a big batch of veggie burgers to keep in the freezer! I'm pretty picky about my burgers but these look great! 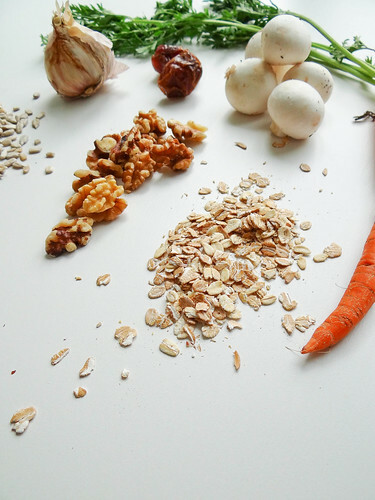 I like the different textures from the nuts, oats and veggies. And I'm intrigued by the carrot greens in them! 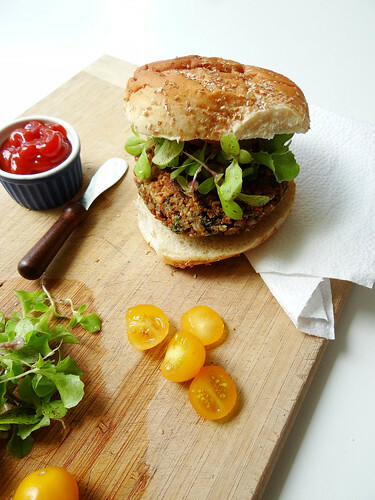 WOW this looks like the perfect veggie burger! Thanks for sharing! You could replace with raisins or some cooked black beans or chickpeas - I haven't tried it that way so am unsure of the results but it is worth a try, you basically need a binding agent.